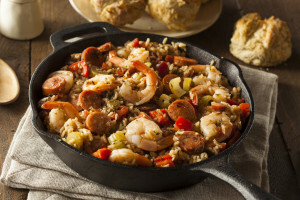 CajunBulletinBlog | Do you have a favorite recipe? Everyone has grown up with their favorite recipes. Maybe it was a regional favorite in your house or one that is known across the world. I remember a congealed salad that we always called GREEN STUFF…well, because it was green and I guess as a little kid I couldn’t say CONGEALED SALAD… besides, green stuff sounds better as kid. I have some favorite dessert recipes that will be posted later. Have y’all heard of CONGO BARS? This entry was tagged Jambalaya. Bookmark the permalink.